'Life' seems to continually intrude on my painting time. The days go by and I realize it has been a week since I touched a brush...maybe longer. Arrgh. Yesterday, frustration overcame procrastination. 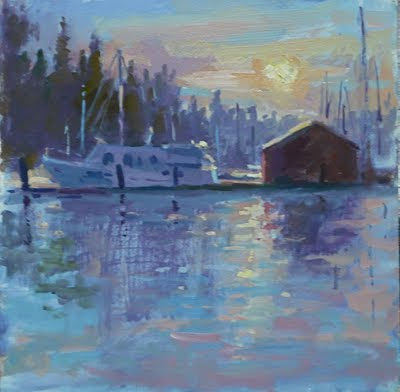 It was 6:45 in the evening, the light was beginning to wane and I had to go paint or spend a sleepless night. So I grabbed my gear, drove several miles to this spot and began throwing on paint. Staring into the sun meant painting from intuition almost more than what I could see, yet I began liking what was happening. The brushwork had energy and spontaneity. By 8:10 I was back home with this piece, proving to myself once again that plein aire painting doesn't have to be a big deal. Just get out and do it. I like it as a study that could perhaps go larger one day. 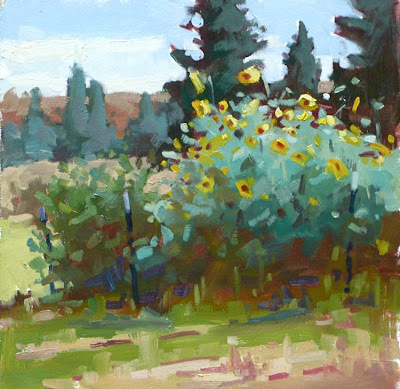 This 12x14 was also painted before breakfast one morning. 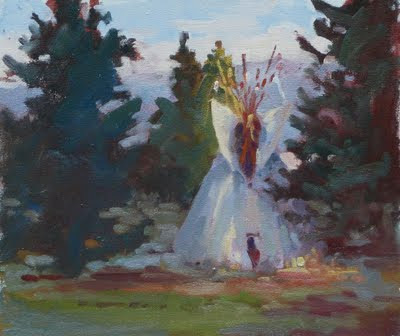 I wanted to catch the light just as it first lit parts of the tepee. As soon as the light hit the right spots I placed them and continued with the rest of the painting. When light strikes a cone shape it does strange things and does them quickly. In only forty minutes it had traversed to the other side. I almost didn't paint this as it is so much a western stereotype, the symbology tending to overcome the rest of the work. It looked like fun so I did it anyway. Perhaps it's fodder for a larger piece. I do like the repetition of cone shapes that the trees add. 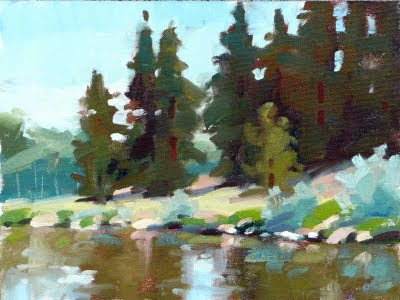 Here is another from the Bitterroot Valley....that I painted in my pajamas. I woke up and there it was in the morning light. I have another 'before breakfast' painting that I'll post tomorrow. I'm finding it difficult to get the color/value balance in these paintings. After I finish here I will reload the last post to make it more accurate, I hope. Even in this one the colors are just a bit too intense...but you get the idea. I got an hour free to go down and paint the Bitterroot River south of Missoula. Free from what, you ask? From helping my friend write his drawing book. I'll post something about it when it gets published. This image will likely have to be reloaded once I'm home as the colors/values appear incorrrect on his computer. We'll see. Simple palette. Cobalt blue, Cad red med, Cad Yel Med, Cad Yel Light and Raw Umber. It makes for quick color cohesive paintings, even if it lacks some of the vibrancy of a fuller range of colors.